Egg Rolls (with meat) - Kosher In The Kitch! 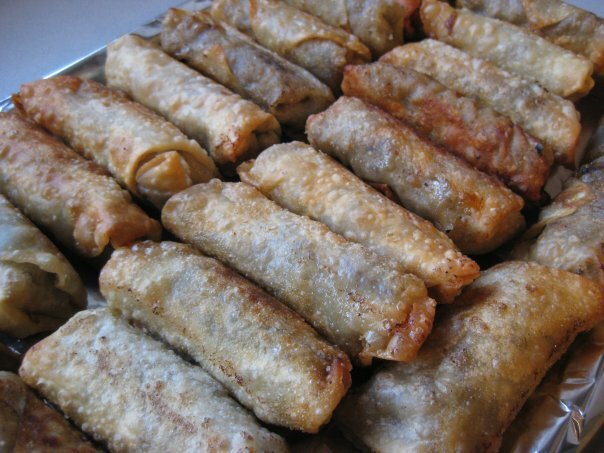 Egg Rolls (with meat) - Kosher In The Kitch! In a pot, sauted 1 1/2 medium onions (peeled, cut in half, and then sliced thinly) till golden. add the chopped meat (i used on package, so about 1.3lb) and mix it together with the onion. pour in a bit of MIKEE’s garlic stir fry & rib sauce as well as drizzle teriyaki sauce all over. cook meat till done (should be all crumbly). set aside meat in a bowl for the time being. Back in the pot, pour a bit of olive oil and saute sliced mushrooms (lots of them). add some more teriyaki sauce and the MIKEE sauce. once the mushrooms are about 3/4 done, add a bag of coleslaw mix (white cabbage, purple cabbage, and carrots shredded). cook it together till done. then add the meat back in. mix till all blended. at this point i’m done for the day and will make the rest of the recipe the next day. easier to split it up. lay egg roll wrapper down with a point toward you. lay some of the meat mixture by that corner nearest you. roll the egg roll (can use back of package for instructions on how to roll and close. i seal with a bit of water). Once they are all wrapped, get ready to fry them. i usually put about an inch high of oil in my pan. heat it up and lay the egg rolls in a single layer. move them around so they don’t stick too much and get stuck. turn when golden on side facing down. lay on paper towels when done. you can make these and freeze them as well. BruschetteKosher in The Kitch Tasting Party!